Vasilii is a PhD Candidate in Chem& Bio Engineering UBC working on smart polymers. 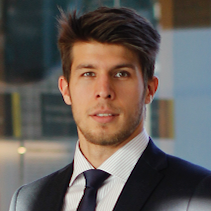 He is a graduate of UBC GMCA mini-MBA program and a winner of 2016 GMCA business case competition. He’s also chaired a conference and advised a UBC student design team. In 2016-2017 he co-founded his company Tesseract Technologies treating brain aneurysms with a novel material. The team won medals in a local start-up competition and won a place in the e [at] UBC Lean Launch Pad program.